Tiny is an eighteen year old girl living on the streets in Sydney, running from her small town past. She finds short term accommodation at Hope Lane, a shelter for the homeless where she meets Nola, a high school student on volunteer placement. Seventeen year old Lola Piper is an intelligent young woman, attractive, wealthy and privileged. As a curricular activity required by her prestigious Sydney college, Lola has reluctantly volunteered to assist at Hope House, a shelter for the homeless community that offers activities for residents, sharing their stories through creativity. Lola is the offspring of two wonderful parents, coparenting friends. Both Lola's mother and father are gay, her father a nurturing transgender woman who became Lola's primary caregiver while postponing her celebrated career. Lola's parents are a wonderful, guiding influence in her life, inspiring equality, compassion and tenacity. Eighteen year old Tiny has been sleeping on the streets of Sydney since escaping her home town of Dubbo, sleep deprived and depressed. As winter begins to descend upon the city, Tiny is offered a three month residency at Hope Lane and through the compassion of others, also begins to change Lola's perceptions. Tiny is a captivating character, a wonderful young woman who is a casualty of her circumstances, homeless and not afforded the same opportunities as privileged Australians. Through creative poetry, Tiny begins to confide in Lola. Throughout the narrative, Pip Harry illustrates the callous installation of defence architecture, metal spikes used as a deterrent to erase homelessness from public exposure. While our governments allocate funding to frivolous enterprises, councils prohibit homeless communities sleeping within the city centre, denying those seeking safety in public places. In Melbourne, the Lord Mayor has amended the legislation to allow police to remove provisional forms of accommodation, further displacing the homeless members of our community. Pip Harry is remarkable. 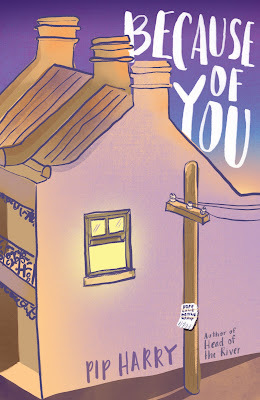 Because Of You is the immaculate and captivating narrative of the Hope Lane community, a homeless initiative that encourages our most vulnerable community members to communicate through creativity. Inspirational and influential. This sounds like a lovely read, Kelly! 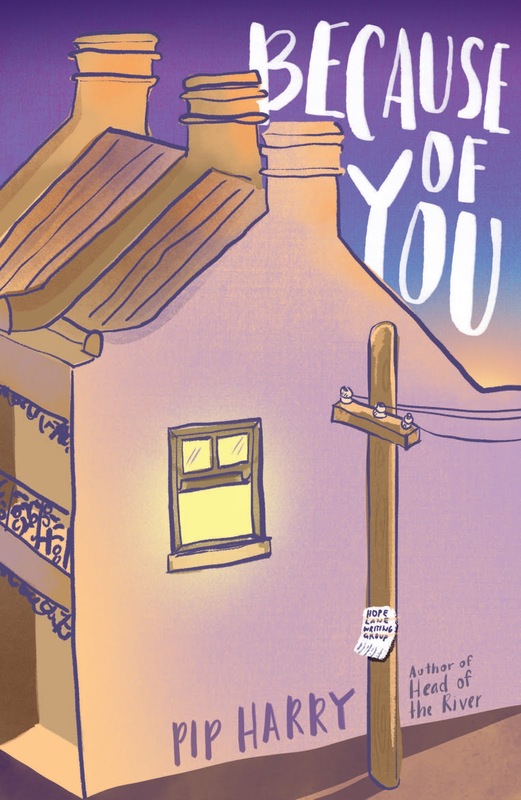 I love that it touches on a topic that's not explored enough in YA - homelessness, but then again, this is Australian YA and I expect nothing less from Australian authors. I love the sound of the diversity within the books and the parents just sound wonderful. I will have to bug my sister for this one for sure. They really don't shy away from the tough, confronting issues do they. Lola's parents were magnificent. I loved how involved they were in each aspect of Lola's life which is rare in young adult. Such a wonderful and thought provoking read. She's incredible Haniya. I loved how it broke down the preconceived ideas of homelessness. Tiny's narrative touched me so deeply and her story stays with you long after the final page. I am sad, thinking about the Sydney tents, a shame the government has their priorities upside down. Awesome book and review there! All the money the government is spending on the marriage equality plebiscite that should have already been passed by parliament, those funds could have been used to place homeless members of our community in accommodation. Instead councils install homeless spikes in areas where people sleep rough. It's absolutely disgusting. Wow. Just wow. I honestly haven't heard or read anything from the author but I guess it's time for me to try it. And this one is definitely what I'm going to read first. Great review! Thanks Vanessa. It's a brilliant read and one I recommend to all young adult readers and those interested in social causes. This sounds like such a lovely read! Maybe the perfect contemporary to pull me out of a reading slump...? Hahaha! Great review, Kelly! It certainly would Lara. It's phenomenal and one of my favourite reads I've had the privilege of discovering. I would love to see what you think of it. The stuff going on in Sydney and Melbourne with regards to the homeless is frustrating and ridiculous. In general though, the way Australia is going is breaking my heart. This is where we came to be safe and where we told our families to come to if they could. I know that's not where this book is going, but you reminded me of how Australia is changing. I'm so glad authors are taking those changes and making them part and parcel of our literature too. I love literature that explores societal and environmental issues too Verushka, it's wonderful for initiating conversations as well. It's devastating. The callous councils and state governments offer temporary solutions but only further displace those sleeping rough. There's so many brilliant community programs that place homeless and displaced community members in care but they desperately need donations. I guess the whole world is going mad. Or least everything feels very bleak right now. I'm glad there are books that give a voice people's struggles. It does Karen, at home and abroad. All we can do is try to make a difference whether it be lending a hand, helping a neighbour or donate to organisations helping those less fortunate. I for some reason had in my head that this book was about something completely different :-| But it sounds absolutely beautiful!!! Your review has made me want to go and get my hands on a copy :-) :-). It's a magnificent read Sarah. I think the cover is a little deceiving though and most readers will expect it to be much lighter than it really is. It's a book I urge everyone to buy a copy and read. I hadn't heard of this one before, but I love the cover! I also like how it's not set in the US, and I've always wanted to visit Australia. It sounds like an interesting contemporary! Great review! Thanks Amanda. There's one aspect about Australian young adult that everyone can agree on, authors aren't afraid to approach the difficult and confrontational issues. This one is brilliant.